Take Back Your Body, Your Bank Account, and Your Love Life After Cancer. I am the Author of "Passport to Life - How I Overcame Incurable Cancer Through the Power of Travel." 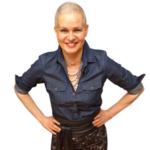 After 3 toxic doses of chemotherapy in the fall of 2013, like many women, I longed to feel beautiful again in my own skin. And I wanted to enjoy a loving, intimate connection with my partner after treatment. I also yearned to take back my financial health after experiencing a prolonged loss of income. But I didn’t know where to find answers to my challenges. I had to piece it all together on my own. Back then, I thought I was the only one who had these challenges post cancer treatment. I've since come to realize there are COUNTLESS women who struggle with these same blocks. I decided that I would do something about it so that others didn't have to struggle so much. So they didn't have to suffer alone in silence. I want you to know that you can feel beautiful again AND rekindle your love life after cancer. What’s more, you can take back your financial health after treatment. I know this is possible because I've experienced it myself. Find REAL answers from someone who has walked in your shoes. Even if cancer has changed the way you look. Even if your doctors swear you’re not going to have a love life after treatment. And even if your out-of-pocket costs have been higher than expected. I'm putting together a team of experts to create a program that addresses all these areas. If you want to be the first to know about it, simply send me a message with your email address. Remember, life after cancer can be EVEN BETTER than it was before. Proud recipient of the YoUnlimitedAward in the New Beginning Category in 2015. 10% of the proceeds from my book, "Passport To Life -- How I Overcame Incurable Cancer" will be donated to Project Forgive, a global resource advancing forgiveness education.